Luxman C-700u preamplifier incorporates the same uncompromising construction and attention to detail as the D-06u. 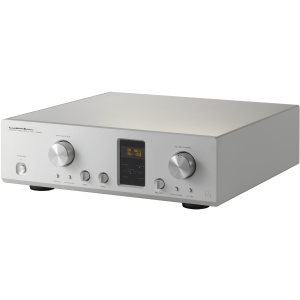 At its core is Luxman’s fourth-generation ODNF (Only Distortion Negative Feedback) amp circuit, which restricts feedback to distortion components only greatly enhancing signal-to-noise performance. This is directly coupled to the LECUA 1000 attenuator circuit, trickled down from the flagship C-900u preamp, allowing an extremely fine degree of volume control and left/right balance adjustment whilst maintaining sound quality at the highest level. Exceptional signal purity doesn’t have to mean basic facilities – not when they are implemented with Luxman’s no-compromise approach. The C-700u includes precision bass and treble tone adjustment (extremely useful given the variability of today’s music formats), a ‘loudness’ control for low-level listening, a ‘line straight’ button that bypasses the tone controls, and phase selection for the balanced inputs. The FL display can even be zoomed in stages via the remote, ensuring key information remains readable no matter how far the listener is from the preamp. In terms of connectivity, the C-700u offers seven line-level inputs (five single-ended RCA and two balanced XLR), plus four line-level outputs (two single-ended and two balanced). Also present is the monitor input and record output RCA terminals, an external preamp input for integration with an AV system, and two remote output terminals for integrated system control.